Language:English, French and Pidgin (Bislama or Bichelama). Area:Land 12,190 km², Exclusive economic zone 680,000 km². Terrain: The islands are mountainous, of volcanic origin with a narrow coastal plain. Climate: The southeast trade winds moderate the tropical climate. Cool April-October average temperature of 23°C. Warm period is November-October, average temperature 28°C. Rainfall 235 cm. Geography: The republic is composed of more than 80 islands arranged in a Y-shaped chain, 70 of which are inhabited. Several of the islands have active volcanoes. The capital is on the main island of Efate. Economy: Agriculture, fishing, offshore financial services and tourism are important industries. Export commodities are mainly agricultural produce such as copra, kava, cocoa, coffee, beef and timber. Mangrove oysters were introduced from theUS in 1920s, in 1972 from Japan and US. Farming of this species was stopped due to pests imported with spats. Macrobrachium rosenbergii (naura). This species was imported in teh 1980's and tried on Efate using concrete cement tanks. However, the development had to stop due to land dispute problems and a lack of technical expertise from the investor in undertaking this development. Tilapia fish (T. mossambicus introduced to control mosquito larvae) in early1980. This species was introduced into some lakes and other water bodies in the country by local health authorities to control mosquitoes. Now it has been accepted as food fish by inland communities and some have then introduced them into other lakes. The Department of Fisheries has been operating a small hatchery for Trochus niloticus to assess the impact and potential of reseeding to enhance wild fishery on the reefs. The Australian funded Australian Centre for International Agriculture Research (ACIAR) funded a 3 phase trochus research over the last 10 years in the country concentrating on all aspects of trochus research from nutrition, seed production and community participation in trochus management. 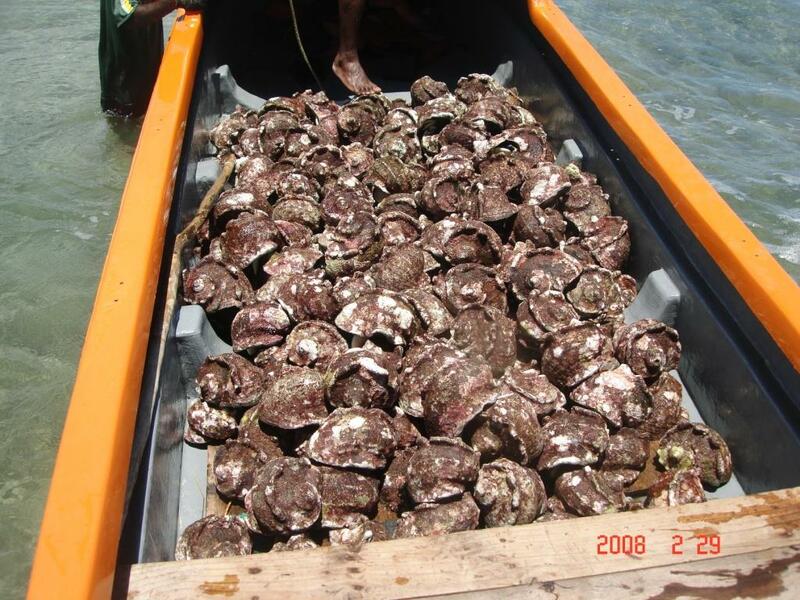 Since 2003, trials on green snail (Turbo marmoratus) seed production in the hatchery began to assess its potentials for propagation and reseeding to enhance wild fishery on the reefs where stock have been heavily depleted due to over fishing. Heavy mortality has been experienced during early larval stages possibly due to deteriorating water quality. However, the trial is continuing. 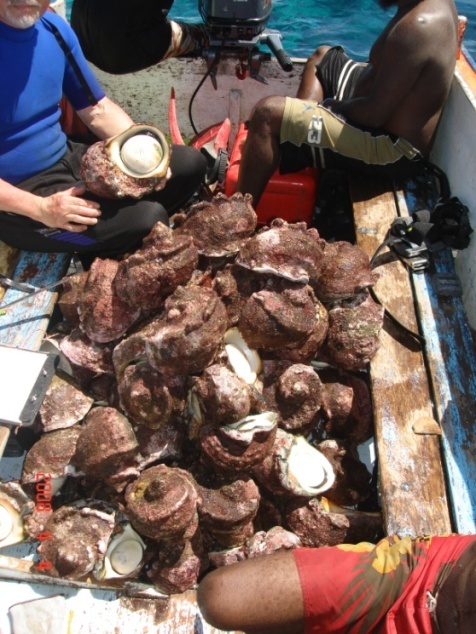 Trials on giant clam breeding were successfully carried out in early 2002 to assess their potentials for seed production, restocking and marketing. Over 100 pieces of hatchery produced clams were sold life to the aquarium operators. This came about after restriction on wild harvesting of giant clam for aquarium trade were further enforced in the country. However, as with many projects in Vanuatu, the government did not have project assistance and mainly funds to develop giant clam farming in the country although trained staff was available. An established aquarium operator has commenced culturing clams since 2005 and has exported 1,000 pieces already to the aquarium market. Since 1996, Department of Fisheries has collaborated with various communities and private sectors in establishing turtle holding facility in response to a regional call to safe guarding turtle as an endangered species. The aim was to establish holding facility for baby turtles till suitable size was reached for release. In 1997, a turtle nursery facility was set up at the Tuktuk Ranch on Efate in partnership with Tuktuk Plantation Limited, funded by AusAid. The Tuktuk Holding facility has ceased to operate due to sale of the Tuktuk Ranch and new owners unwilling to continue with the project. In 2001, another holding facility was set up at the Tranquility Island Resort, funded by New Zealand aid. This is still operating. A prominent local business man, Mr. Dominic Dinh also set up a holding facility in Port Vila which currently holds about 500 baby hawksbill turtles. In 1996, a feasibility study assessing the potentials for black pearl culture was investigated at Peskarus in the Maskelyn Islands between the Department of Fisheries and a Tahitian Pearl Company. The study concluded that while stocks of black lip pearl oysters were found in the area, numbers were not sufficient to support a commercial farm. As a result, pearl farming trials were abandoned. Seaweed farming trials commenced in Vanuatu in early 2000 as a result of a regional effort and promotion of seaweed as an alternative commodity for small island developing states such as Vanuatu. The Vanuatu Fisheries Department injected approximately VT 4 million to investigate the feasibility for seaweed farming in the country and trials were carried out on Efate, Malekula and Santo. While favorable growth was obtained in all sites tested, communities lost interest due to a lack of revenue generated from seaweed harvest. Seaweed market is favorable for export market and requires large production (e.g. 20 tonne) to be feasible. In addition, the government did not have the funds to inject into mass production of seaweed farming in the country. Farming of marine prawn Litopenaeus stylirostris at Teouma Prawns has had its first successful harvest in November 2005. Cultured prawns were sold at local market outlets in Vila and Santo and export trials were also conducted. 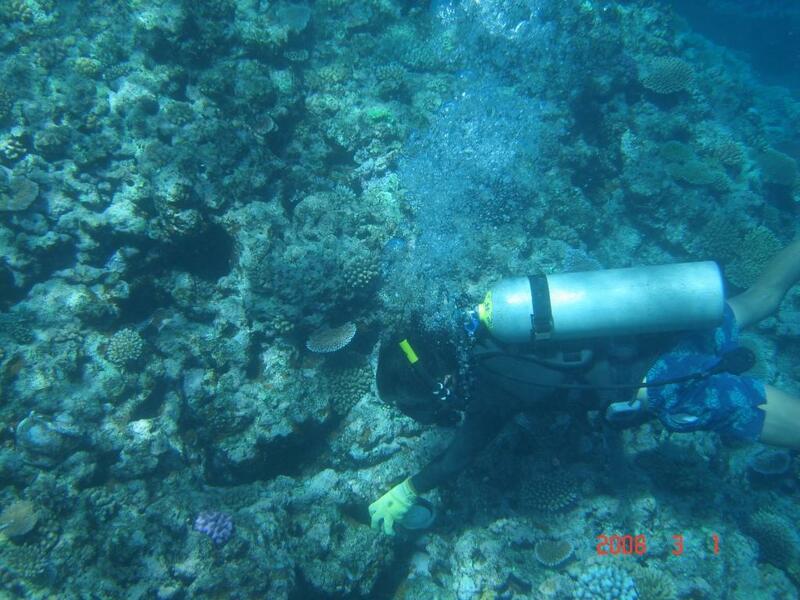 Coral culture is carried out on small scale by a number of aquarium operators. Initiative to commence coral culture is to encourage operators to pursue coral culture as the best viable practice in minimizing further degradation of coral reefs in the country. There are 3 aquarium operators engaged in small scale trials of coral farming in the country. GIFT tilapia, an improved strain of Nile tilapia (Oreochromis niloticus) was introduced to Vanuatu from Fiji Fisheries in 2004 to investigate its potential for farming in the country. The species is now gaining a lot of popularity as an important food fish with small scale community farms being set up in Santo, Tanna and Efate. 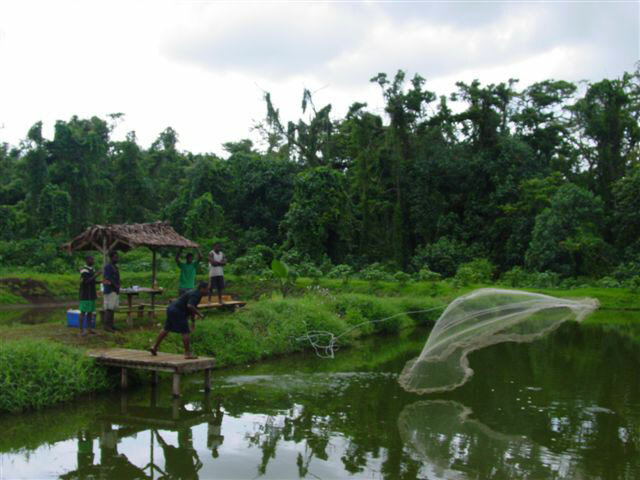 In 2005, Fisheries Department conducted a feasibility study on the potential of freshwater prawn (Macrobrachium lar) in Sarete village, South Santo. 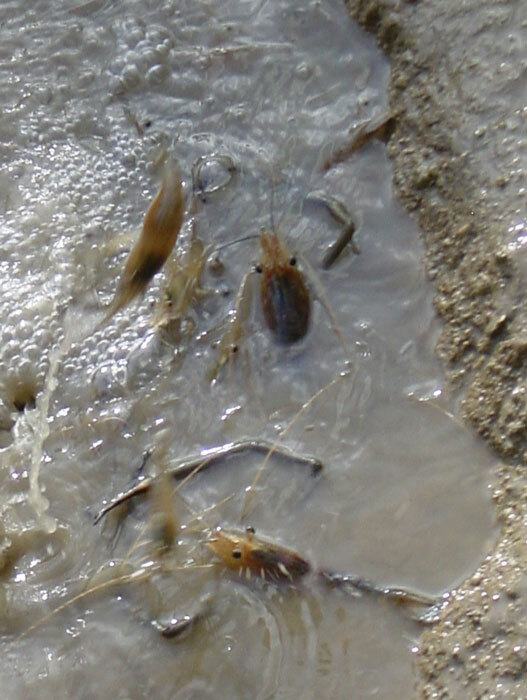 Juvenile prawns trapped in nearby rivers and stream were mono-cultured in 10m x 5m earthen ponds and fed with an high quality prawn feed supplemented with kitchen wastes such as taro skin and coconuts. Cultured prawns were successfully reared to market size (36.5g) after 4 months. Top shell trochus (Trochus niloticus) is primarily targeted for its shell which is processed locally into blank buttons and exported to China and Hong Kong for the fashion industry. In 2004, total processed trochus exported was 35 tonne contributing more than VT 35 million in foreign exchange. Giant clam farming is primarily for live aquarium trade and stock enhancement. Methods for all phases of aquaculture have been developed and are readily accessible in manuals and through experienced personnel. Techniques for rearing larvae and seeds also use relatively low technology compared to other shellfish and fin fish. The main market is live clam which are sold for very high retail prices in the overseas market for between USD20 to USD 300 per piece. The local aquarium market buys them for VT 500 (USD 4.50) per piece. There is a lucrative market for the adductor muscle, no market for meat from smaller. Coral farming mainly from the scleractinian group is primarily targeted for the aquarium (live) and curio (dead) coral trades, reef restoration and enhancement of snorkeling trails for eco-tourism activities. The VFD has prohibited wild harvest and export of coral, placing more emphasis on cultured corals. And cultured corals, according to the convention of international trade on endangered species (CITES) regulation of which corals are also enlisted, cultured corals are only certified as grown from second generation cultured stock. Teouma Prawns is the first large scale aquaculture operator to be established in Vanuatu focusing on penaeid shrimp. 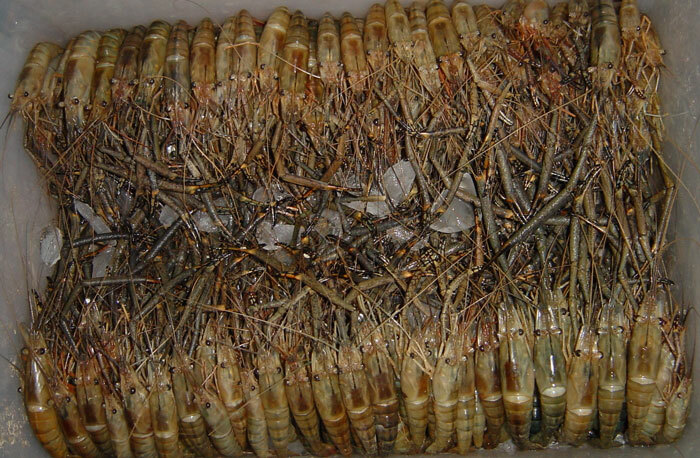 After nearly 4 years of construction, a first su ccessful harvest of marine prawn (Litopenaeus stylirostris) by the Teouma Prawns on 19th Nov. 2005 saw the Port Vila and Luganville markets being flooded with fresh cultured prawns. The prawns were sold between VT 2,000 (Port Vila markets) and VT 2,200 (Luganville markets) and export trial shipment were made to Australia and New Zealand markets. The main market for fresh prawns will be the export overseas market. Since the introduction of GIFT Tilapia into the country in mid 2004 by joint efforts between Fiji Fisheries and Vanuatu Fisheries Department, a semi-commercial pilot farm has been set up in ERAPO on Efate to trial tilapia fish farming. Over 5,000 fingerlings were imported from Fiji Fisheries and stocked in two 50m x 20m ponds at ERAPO. The farm has so far produced over 1 tonne fresh tilapia fish averaging 400g for the local market. In 2005, new pilot subsistence farms were set up in Sarete (South Santo) and Middle Bush (Tanna). Both sites have each successfully reared fish to market size after 4 months of farming, each producing 50kg fresh fish that were sold to the local markets at a price range of VT 350 - 45o/kg. Investigation into the potential of farming freshwater prawn of the species Macrobrachium lar began in Vanuatu in mid 2005 although the species is known to have been reared on subsistence basis in conjunction with water taro mainly in the northern islands of the country such as Maewo, North Pentecost and some parts of Santo. The species fetch a market price of between VT 1,000 to 1,500 per kilo (kg) and are sold mainly to restaurants and hotels in Vila and Santo.